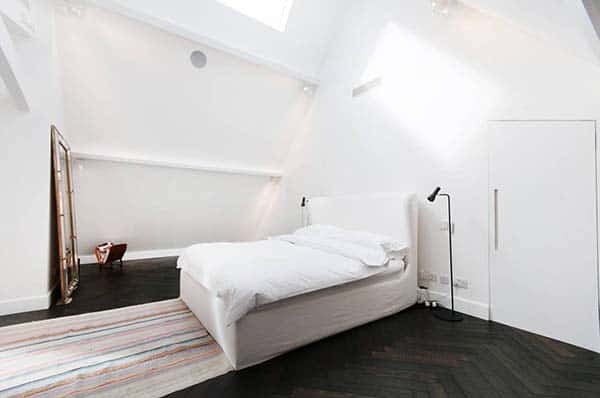 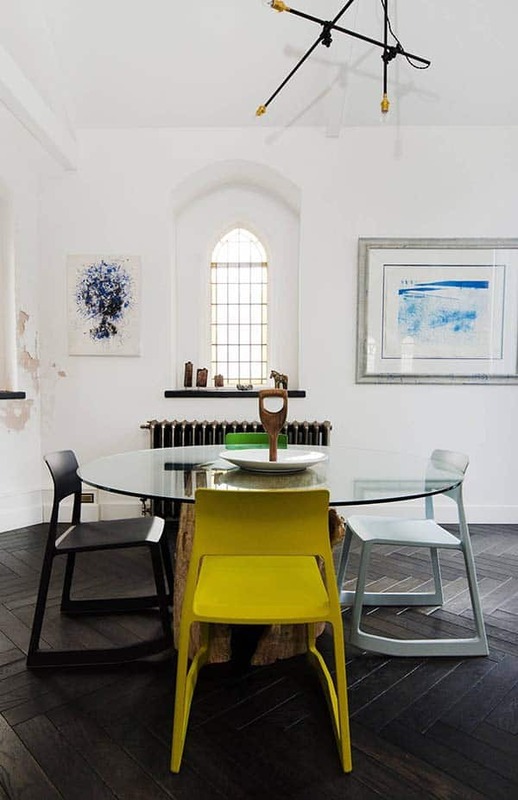 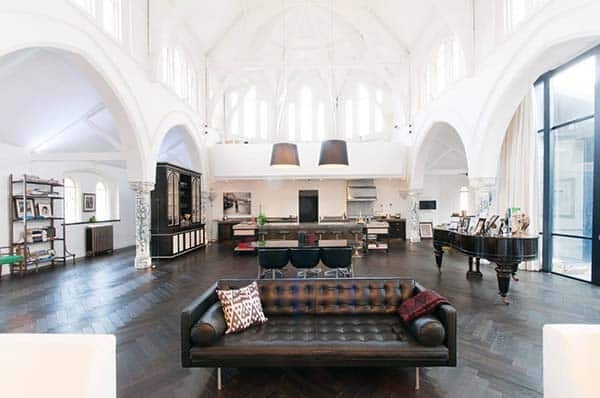 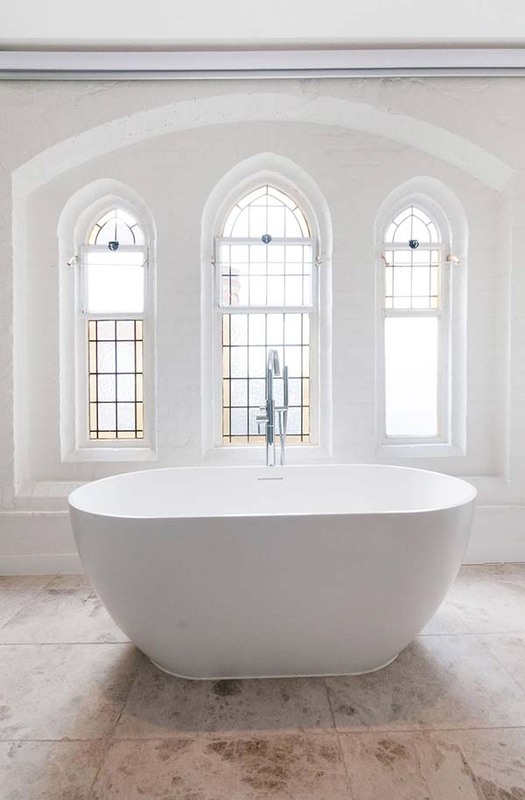 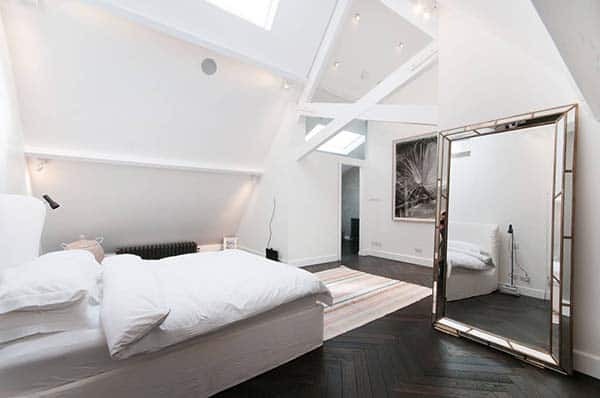 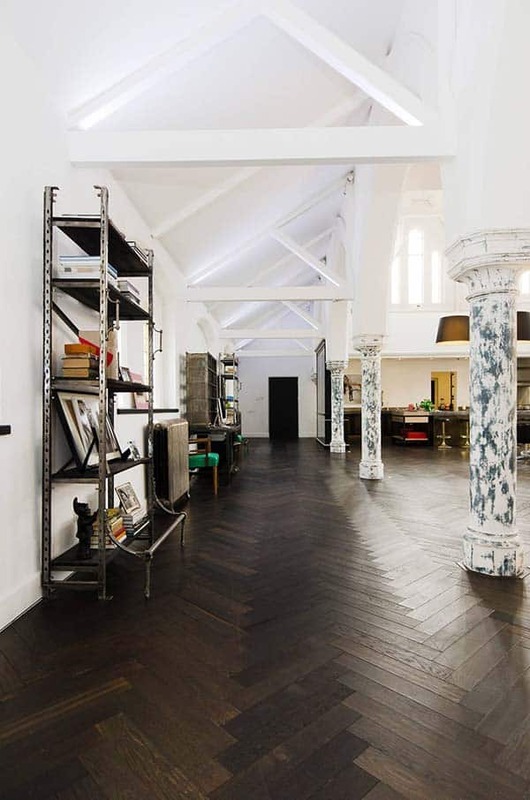 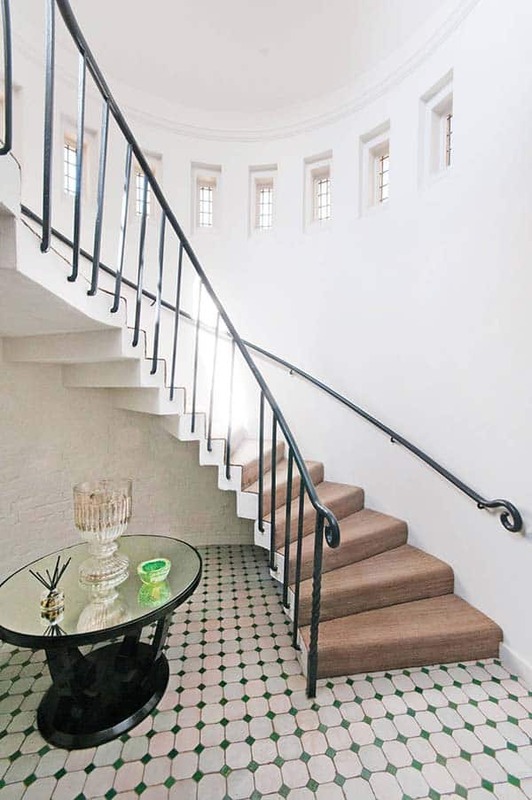 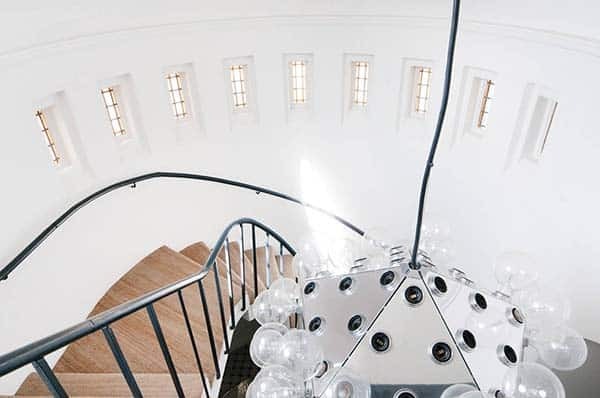 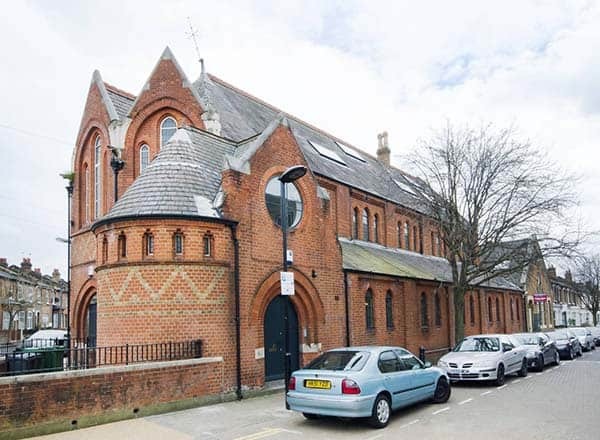 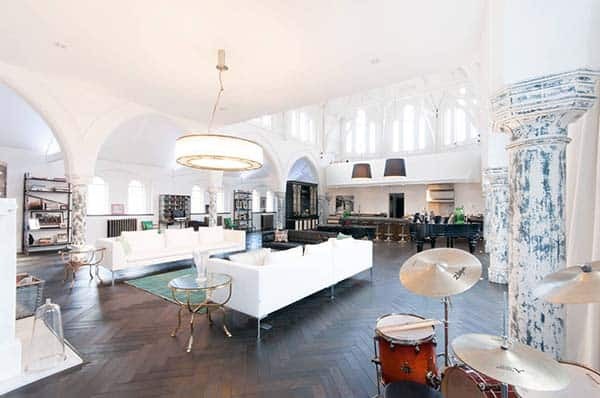 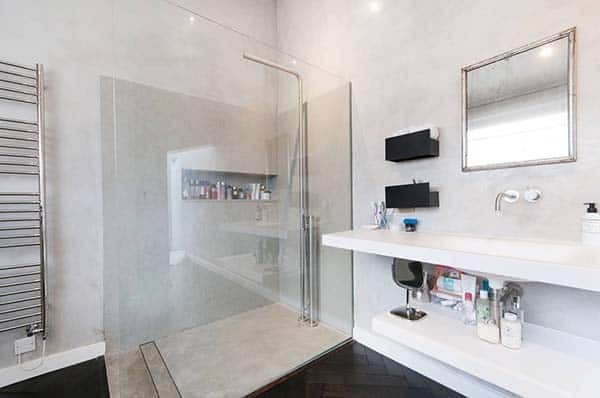 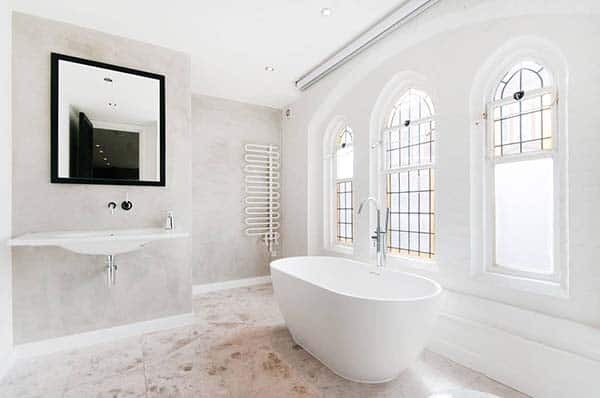 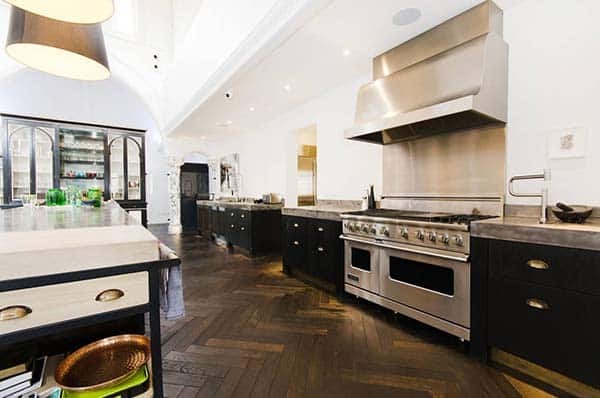 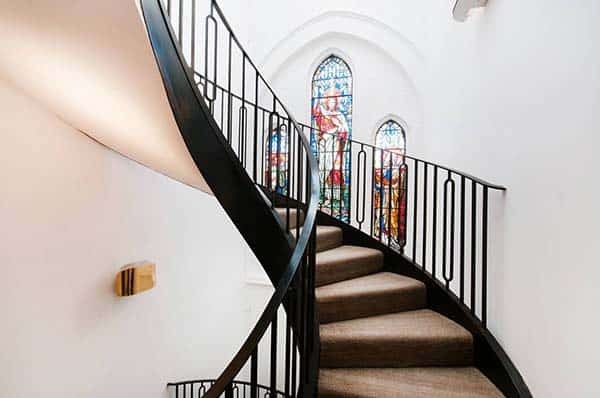 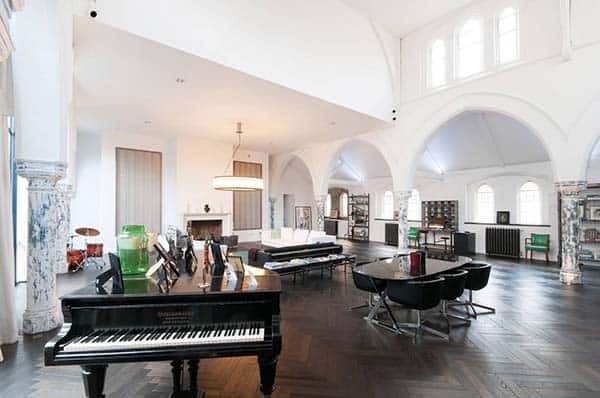 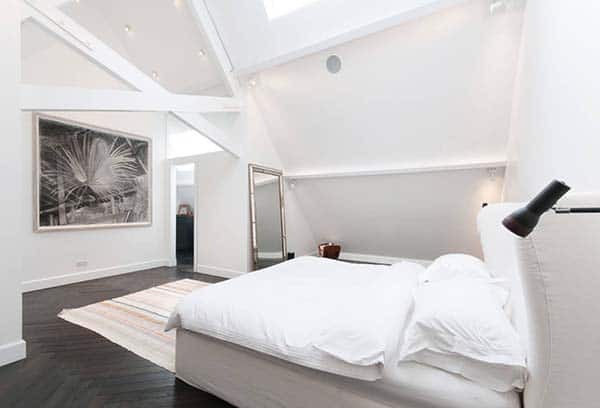 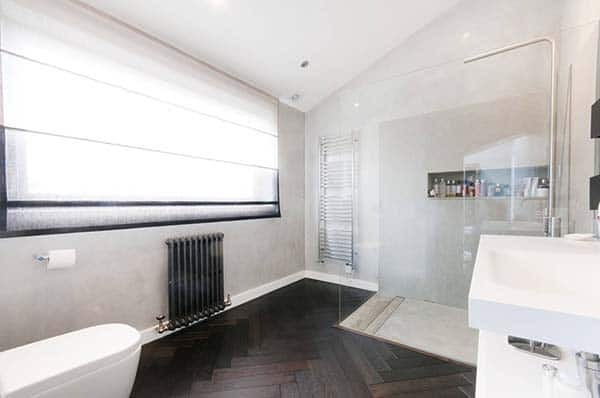 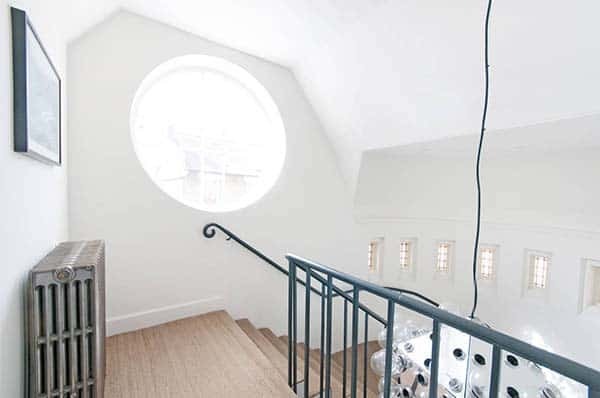 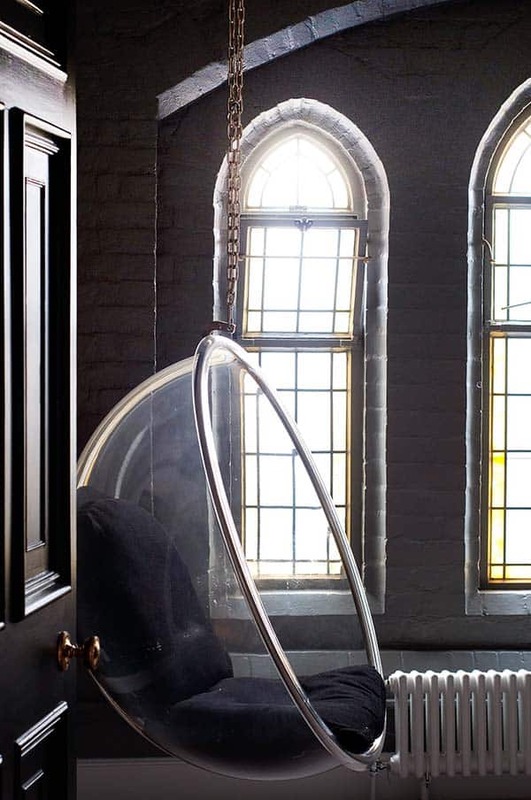 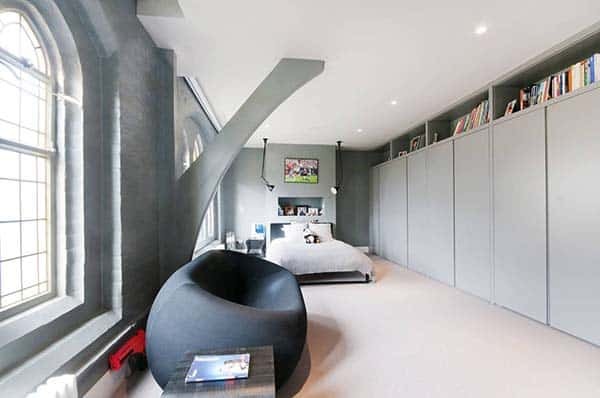 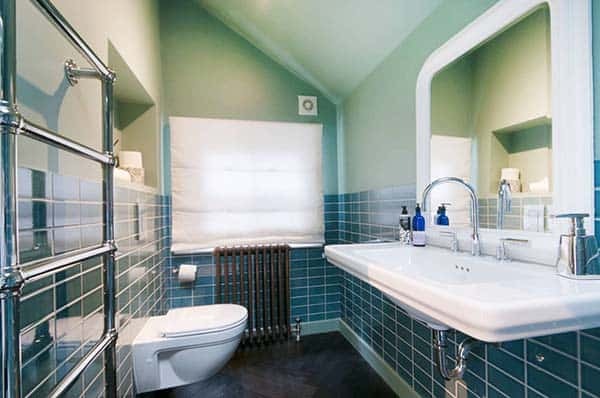 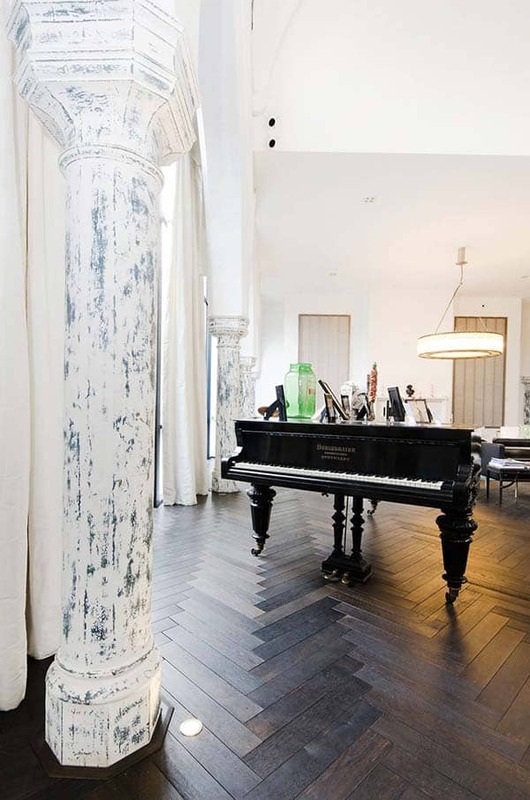 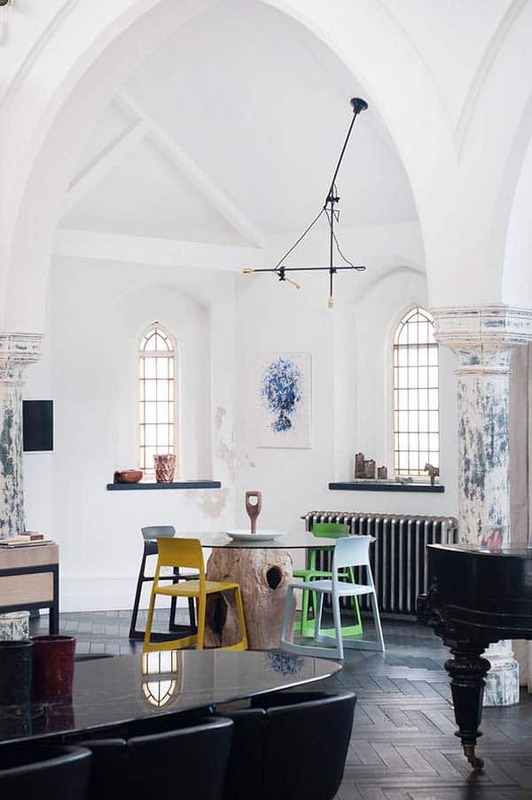 This beautiful four bedroom converted church showcases unique preserved features, situated in the heart of Kenmont Gardens, North Kensington, London, England. 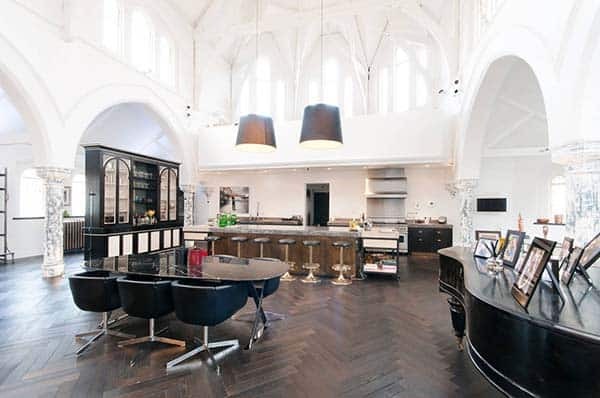 The 6,167 square foot residence is distinguished by jaw-dropping open plan interiors with soaring ceilings that encompasses a kitchen, dining area and living spaces. 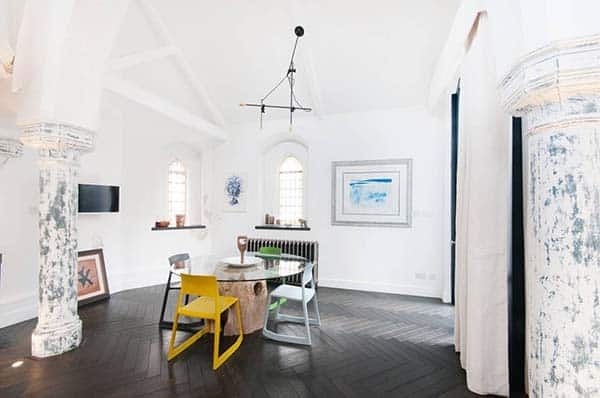 Arched windows flood the home with light, imposing white walls helps to reflect light, and original structural columns helps to add character into the home. 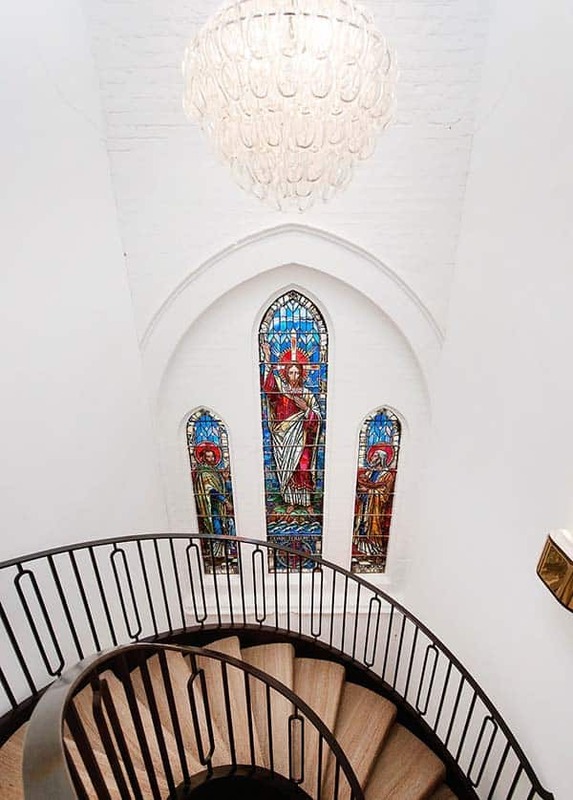 There is also a private patio with a waterfall, original stained glass windows and parquet flooring throughout all the public spaces. 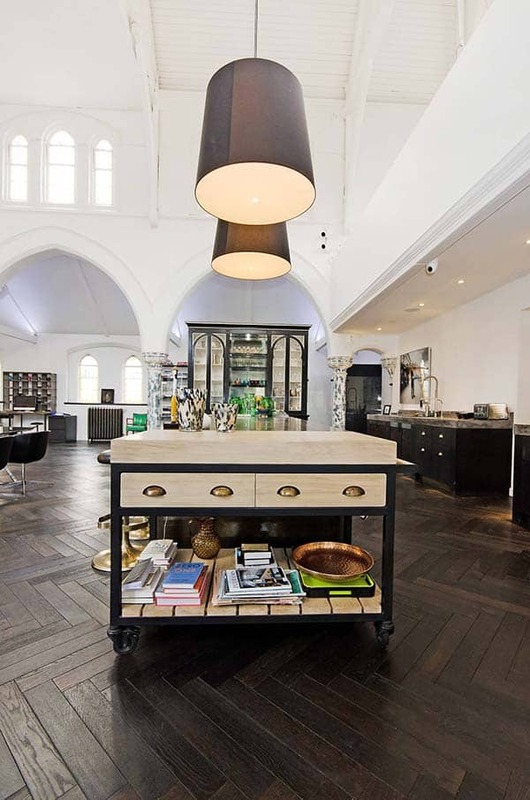 The fabulous chefs kitchen offers a beautiful island with bar style seating and New York and Corian Concrete work surfaces. 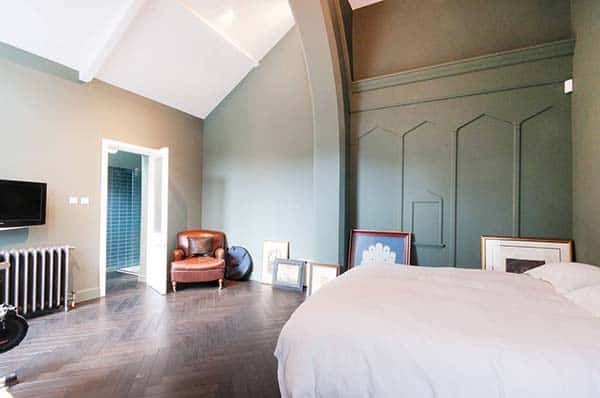 All of the four sumptuous bedrooms include en-suite bathrooms, three of them have wonderful walk-in closets. 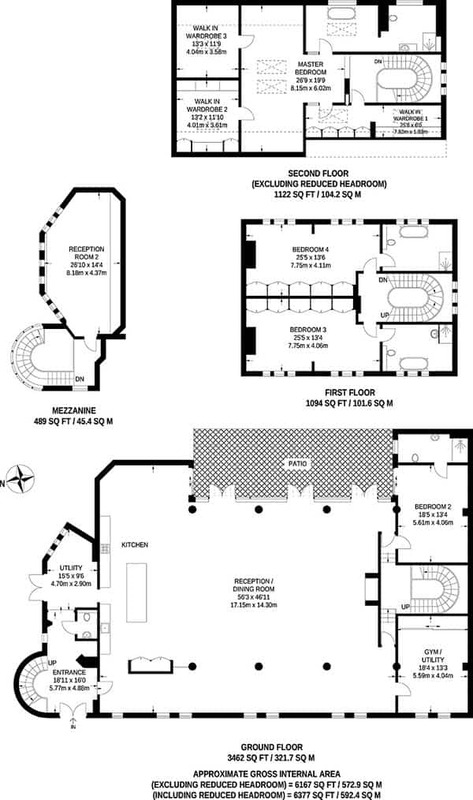 Spotted for sale on Foxtons for $15,000,000. 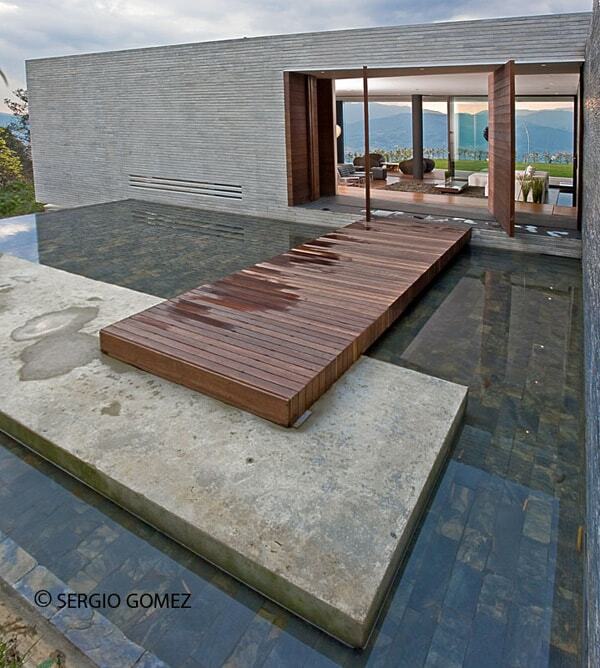 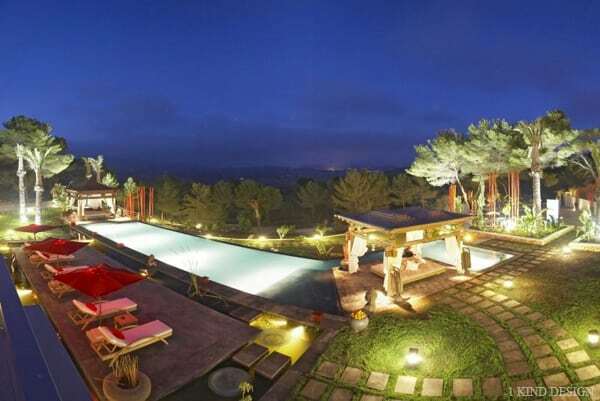 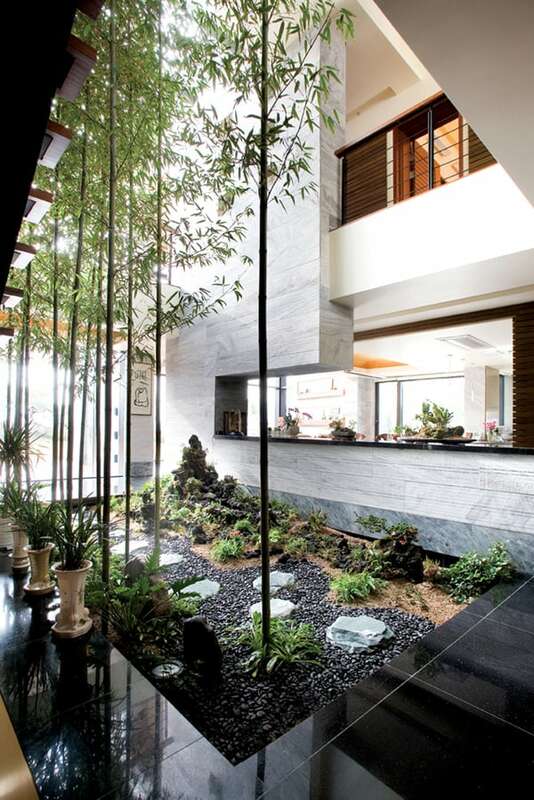 Once inside this architectural wonder, you are amazed by its volume and meticulous transformation into a modern home. 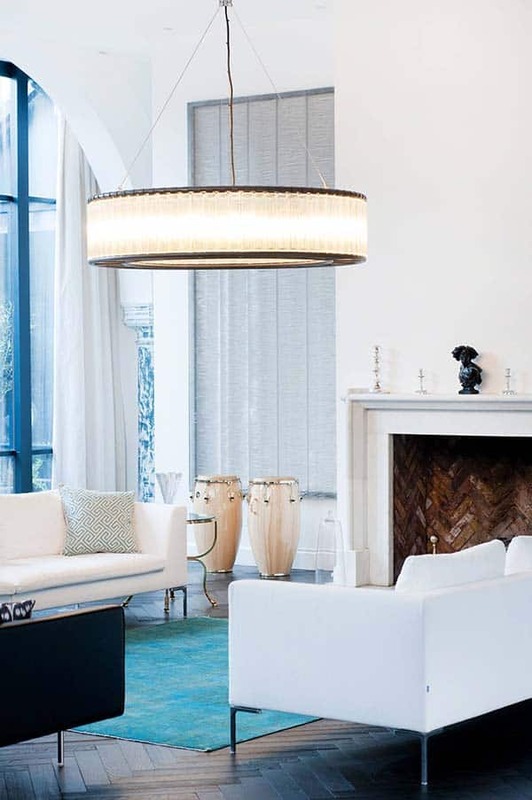 The ceiling height over the living room is lowered, which makes this space feel cozy and comfortable, with the addition of an area rug for not only division of space but to add texture and color. 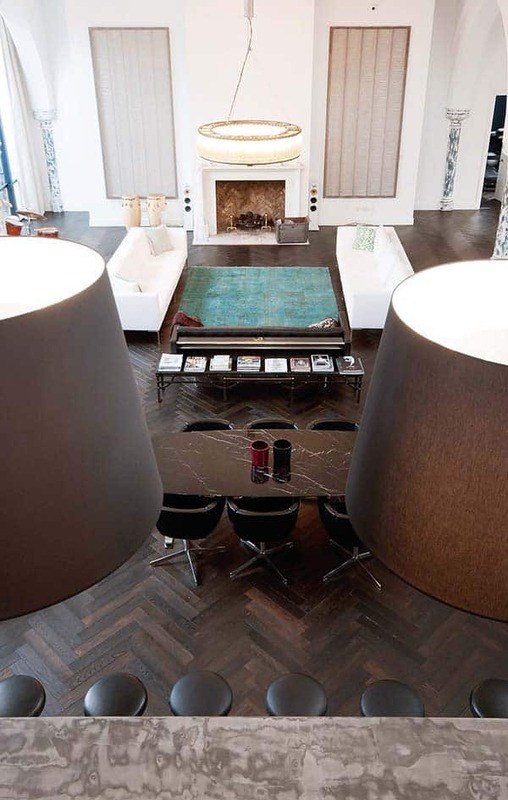 Furniture arrangements help to keep spaces separate, yet the open interiors helps to keep a nice flow throughout the lower level. 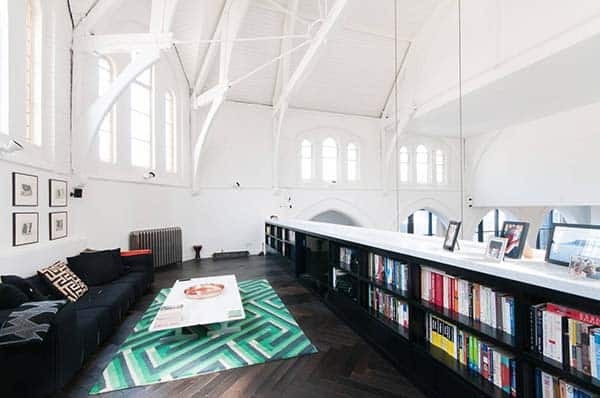 This is an incredible transformation with some spiritual enlightenment preserved in the structural details. 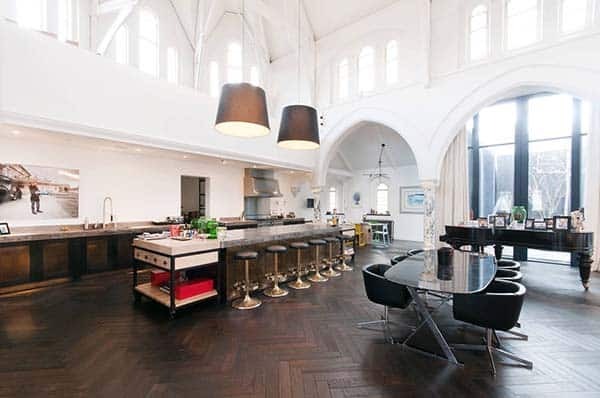 What are your thoughts on this conversion project, could you find yourself living here? 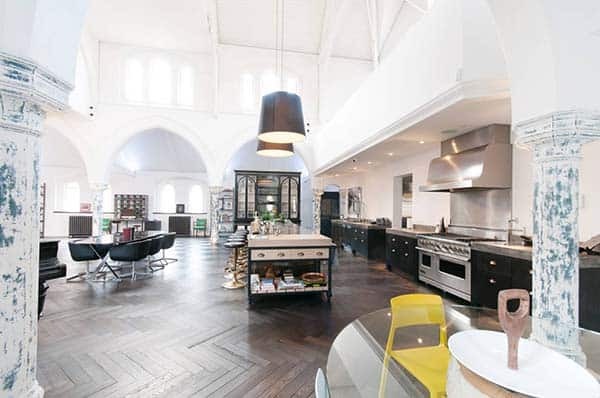 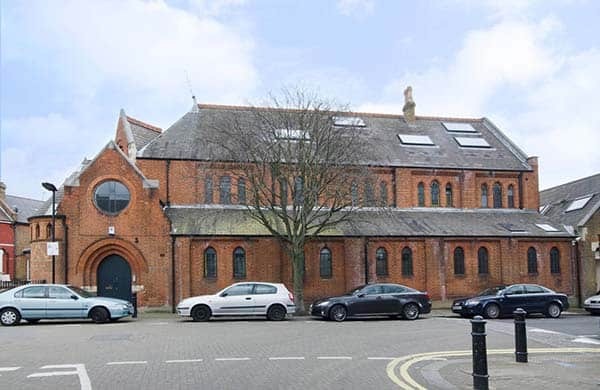 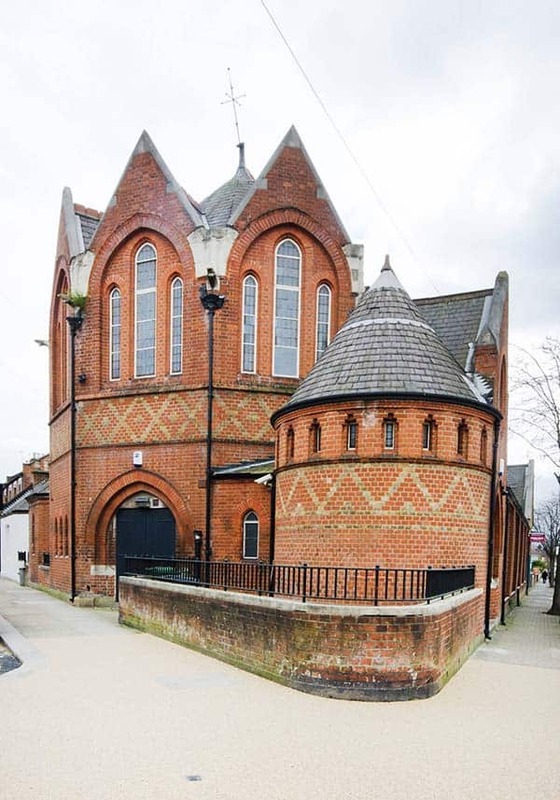 Love church conversions, have a look at some others we have written about here.